Robeks Fresh Juices and Smoothies is growing in Connecticut with the addition of new location in Shelton. This marks the seventh location in the state and the second location for franchise owners Patrik Kovac and Mark Henriques. “Both Mark and I are extremely excited to be opening our 2nd location in the Connecticut region. Our first store in Danbury, CT has been quite successful for us, so we felt that opening a second location was the right choice. While our Danbury location is more family focused, our Shelton location focuses more on serving the local businesses, but at both locations, our #1 goal is being able to provide both customers with tasty and healthy options. It’s been really hard work, but 100% rewarding at the same time.” Patrik Kovac, Owner. 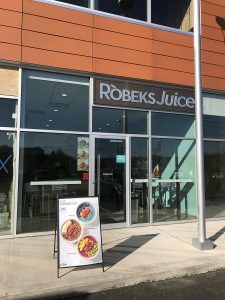 With stores open across the country, Robeks Fresh Juices and Smoothies has built a reputation for exceptional quality and emphasizes fresh, healthy options for every part of a person’s day – from morning starter to post workout recovery. The brand recently announced new functional smoothies available for a limited time offer. The new flavors include: Mango Kickstart, Go-Go Green, and Almond Berry Fuel. The Shelton Robeks is located at 110 Commerce Dr, Ste 114, Shelton, CT 06484. Follow the Shelton Robeks on Facebook and Instagram.